Originally from Memphis, Stephan Crump has been a Brooklyn resident since 1994. Crump’s abiding interest in creative improvised music has found him collaborating with many of his generation’s luminaries. Eschewing genre conventions, Crump has performed and recorded with a wide range of musicians, from Patti Austin and The Violent Femmes’ Gordon Gano, to Jim Campilongo and the late blues legend Johnny Clyde Copeland. Currently, he can be heard as a long-standing member of Vijay Iyer’s Trio and Sextet, Rez Abbasi’s Acoustic Quartet, and Liberty Ellman’s Sextet, among others. His own ensembles include the duo project Secret Keeper (with Mary Halvorson), the all-string Rosetta Trio (with guitarists Ellman and Jamie Fox), and Rhombal, a piano-less quartet that features Ellery Eskelin, Adam O’Farrill, and Tyshawn Sorey. Crump hails from an artistic family, and was raised in music by his Parisian mother, an amateur pianist, and his Memphis-bred father, an architect, painter, and jazz drummer. 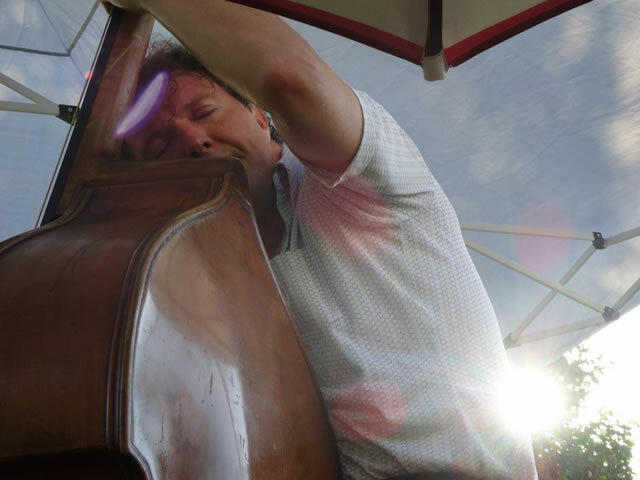 Crump, who initially studied classical piano and alto saxophone, took up the bass guitar at age 13, spending his formative years playing in rock and funk bands around Memphis. Crump received his Bachelor’s degree from Amherst College, where he studied classical contrabass technique under award-winning composer Lewis Spratlin; his collegiate jazz studies included work with Ray Drummond, Frank Foster, and Max Roach. Since embarking on a career in music, the bassist, composer, and bandleader has recorded almost a dozen sessions under his own name, along with numerous film scoring commissions. This interview was conducted in the winter of 2017, concurrent with the release of two new albums from Intakt Records: Asteroidea, a piano trio effort featuring Kris Davis and Eric McPherson; and Planktonic Finales, the first recording by the collective of Crump, Ingrid Laubrock, and Cory Smythe. Troy Collins: Some biographical information might be beneficial for readers unfamiliar with your background. Your mother and father were both involved in the arts. How did that influence your becoming a musician? Stephan Crump: My mother, who is from Paris, plays piano, and my father is an architect and painter but also an avid jazz fan and amateur drummer. I grew up in Memphis in the ‘70s and ‘80s, and while there was a lot of music in the house, there was also a lot of live music around town. And creativity, in general. I was exposed to a lot of visual art as well. My uncle, Stephen Crump, who was my childhood hero, is a wood sculptor. From my late teens into early college years, I got to work for him during the summers. His attention to detail, including painstakingly working, sanding, and finishing the wood until it’s almost like skin, as well as his playful, graceful sense of form, had a huge impact on me. In my earlier years, I also got to spend time in the backyard on weekends with my dad as he worked on large-format abstract paintings, as well as “help” him make models of his architecture projects. Also, my grandmother owned and ran a great used bookstore, Burke’s Books, and I spent a good amount of time with her there and at home. Not only did she instill in all of us a love of literature, but she was an excellent storyteller, and I remember being in her lap on the rocking chair, putting in my request for a scary story. She would weave a thrilling tale every time. Reflecting on all this, now, from so many years later, I believe the sense of storytelling and casting the spell, along with an emphasis on sculpture and form, is as relevant to what I try to do as is all the music I’ve loved ... or almost! Speaking of love, my first love was Stevie Wonder. Along with Stevie, my father was constantly spinning Monk, Trane, Miles, MJQ, Phineas Newborn, Jr., and other greats, and his system was just on the other side of my bedroom wall, so I was rocked to sleep by, say, Percy Heath more often than not. I always heard and wanted the bass, but my mother had me start with classical piano lessons when I was about 6 years old. It wasn’t until seventh grade that I got my first electric bass, which was a maple-glo Rickenbacker 4001, similar to those played by two of my heroes, Geddy Lee of Rush and Chris Squire of Yes. At that time, I also began a couple of years of alto saxophone in the concert band at the public school I attended. Let me pause, here, and register how thankful I am that there was a music program in the Memphis City Schools. TC: Can you elaborate on what you feel the public-school music program offered that you don’t think you would have gained on your own, say, taking private lessons and/or playing with friends? SC: Well, I was taking private piano lessons up until this point, in seventh grade, when I finally got my first bass, and also started with the alto. I switched to private lessons on the bass for a time, but soon moved to just learning off records and watching people, live. My older brother, Patrick, played guitar in a rock power trio, and I attended almost every rehearsal and show, sitting at the feet of their bassist, who played a P Bass with a pick, which I still believe is the coolest thing anyone could possibly do. The bassist, who was the drummer’s older brother, went away to college the next year, so I got my first gig starting in eighth grade. This was simultaneous to my playing alto saxophone in the school band program. We’re talking middle school, or junior high, as they called it, probably the most challenging time, emotionally and socially. So, in addition to the intellectual growth one experiences through learning an instrument and studying music, our band teacher was excellent and serious but also a lot of fun. Having this communal experience with 30 or more of one’s peers that involves working together and channeling all this wild energy in the context of vibrating, harmonizing and trying to make something beautiful, was invaluable. Very important to add is that I was coming from a private, all-boys and almost all white elementary school. I have my mother to thank for pushing for this change, and I was ready, to put me into the public-school system where I’d be learning not only in the classroom but in my interactions with a peer group that represented the actual population of Memphis, which was majority African-American, and of course half female. So, add to the context of this band program the fact that I was engaging in collaborative, spiritual work with young women and people of color for the first time in my life. It was transformative. And as much as the band class itself was enriching, at least as powerful were the first five or so minutes before everyone had settled in. It was a loose time during which kids were beatboxing and breakdancing and grooving on percussion instruments (remember, this was mid-80’s). A lot of making music with their bodies, and focusing deeply on the groove. This has stayed with me, the fact of music being a magnetic, visceral experience, on the first order. TC: That would certainly help to explain your focus on rhythm. A number of groups you’re involved in (Secret Keeper, with Mary Halvorson; the Rosetta Trio, with Jamie Fox and Liberty Ellman; and the trio with Ingrid Laubrock and Cory Smythe that recorded Planktonic Finales, for example) are all drummer-less, leaving you as the primary rhythm player. How does your approach to the bass change when performing with those groups, compared to say Vijay Iyer’s trio, the Borderlands trio, or your piano-less quartet Rhombal, all of which feature a drummer? SC: Let me clarify from the start that I consider every member of a group a rhythm player, on the first order. In other words, our musical gestures impact and interact with each other and with our bodies on a physical level, at a particular point in space and time, before they engage us in other ways, such as pitch information, texture, color, harmonic and melodic relationships, etc. Whether we own up to it or not, our gestures are interacting as such, and we need to be responsible for nurturing their relation on that plane. If we care for the living, magnetic force that can exist between and among our gestures, we might turn what would be just a pile of notes into a constellation, something with meaningful structure and that tells a whole story. More and more, I believe that’s where the music lives. I must credit my wife, singer and songwriter Jen Chapin, as one of my first partners in a deep exploration of drummer-less playing. About fifteen years ago we made a bass/voice duo album, Open Wide, and toured all over the country. It’s a great challenge to support and develop a song with just those two elements. It pushes you to expand what you can offer the music, what roles you might inhabit. On a time-based level, one helpful image to consider is bouncing a beach ball back and forth while keeping it in the air. The gestures you each make must have a certain lift, or the time falls apart and hits the ground. That lift can take on different meaning, depending on the moment and context. For instance, in a delicate moment it could be more like blowing a feather from underneath to keep it afloat. Back in 2004 when Rosetta Trio began putting our first music together, we had to work very deliberately on who had what role when, and who should give more push or lift, so that the others could lay back a bit. Often, whoever had the melody or lead solo would be given more leeway to lay back into the time, to be more expansive and expressive, while the others would give a bit extra push to keep things afloat. It got really complex in moments when we were sharing multiple roles, simultaneously, but exploring this was critical in giving the music the right feel and life, and it’s beautiful how now (we just recorded our fourth album, to be out later this year) we don’t have to discuss these kinds of functional issues when working on a new piece. It’s just become part of the organism. There are a couple of principle reasons I began exploring drummer-less duos and trios over the last decade. I wanted room to explore the seemingly infinite sonic and textural possibilities of the acoustic bass, much of which are quickly covered up in more traditional lineups. Also, there’s an expansion of roles and responsibilities that happens as one reduces the number of ensemble members. It’s a magnification of perspective, allowing the fewer remaining elements to take on more meaning. Taken to its extreme then, one note could become a planet. Mary and I actually have a Secret Keeper tune called “Planets,” because this is the very concept we were pursuing. The Planktonic Finales trio with Ingrid and Cory, to me, has a sort of magnificent, fertile fluidity that engenders a continuous shape-shifting of roles within the group. But I don’t think about it as my approach changing in groups with or without drums. I don’t perceive it so categorically. It’s more about dealing with each context, the music, the spirits and sounds. When we stop hampering ourselves with orthodoxies about what’s deemed correct in a particular musical context, and just focus on what we feel the music needs in order to feel alive and communicate something real, it pushes us to expand our own sense of possibility and grow. An example that comes to mind is the first song of the Borderlands Trio album (with Kris Davis and Eric McPherson), Asteroidea. It’s about 26 minutes long and develops into many different areas, but I remember in the studio how Kris started things off with this riveting left-hand ostinato, then Eric joined in on the groove. It was my turn, and I was absolutely gripped by what they were offering. In that flash decision-making, I realized Kris already had the bass function covered, so I guessed I was the lead and I’d better make it work! I grabbed the bow and jumped in. That’s scary stuff, but it’s exactly where we want to be, diving straight into the fear and willing something right to happen. Borderlands Trio is an example of a traditional lineup that can be extremely expansive sonically and functionally, owing to the broad, open sensibilities of Eric and Kris, and how deeply they each think and hear on the level of composition and orchestration. In regard to the Rhombal quartet, I knew I wanted drums and breath, and that my role would be a bit more “traditional” perhaps, so I created other challenges and left room by omitting a chordal instrument. This creates a magnification and allows the band to become that instrument, sometimes in an additive, linear fashion, and at other times, vertically, together as one. It also places an emphasis on shifting geometries and just, simply, vibration. TC: Speaking of a “traditional lineup that can be extremely expansive sonically and functionally,” can you elaborate on what your ongoing working relationship is like with Vijay Iyer, in his trio? SC: Well, at the moment there’s a lot of action with the sextet, as we just released an album in the fall. I’m also looking forward to some dates with Blind Spot, a project co-led by Vijay and Teju Cole. For this year, it’s looking like only sporadic activity for the trio, but hopefully more will materialize. It is a beautiful, shape-shifting beast. I have an easier time with more specific questions in this regard, given that my collaboration with Vijay began nineteen years ago, back before there were any gigs and we were just getting together to work on the music. We’ve done so much over such a long period of time that it’s hard to discern the specifics and their impact, as it’s all so woven into our lives, but I couldn’t really overstate it. Our collaboration has been one of the great blessings in my life. I’ve learned and grown by incalculable degrees from our work at the music and shared experiences on the road. Those experiences have ranged from ecstatic glory to absolute scuffling slog, but all of it has been rich and real, especially in terms of humanity, the interactions and collaborations with so many beautiful spirits. Also, taking part in the summer workshop that he’s been leading at the Banff Centre has been transformative for me. It’s clarified that, as much as composing and performing is my focus, teaching needs to keep growing as part of my mission, that I have something unique and valuable to offer in that realm. I’m now working on writing what I hope will become a book, or at least more than a pamphlet(! ), of some of the concepts that I’ve been sharing. TC: I saw you perform a few years ago with the Rosetta Trio, at a local college (F&M University, in Lancaster). You had just finished a short residency/workshop, and the concert was the culmination of that stay. What do you typically teach students in those workshops? SC: Of course, I try to read where people are and determine what might be best to offer in our limited time together. I’ve discovered that in school settings young musicians are usually plenty involved with learning, transcribing and analyzing music, and I’ll encourage them along that important path, as well as implore them not to create barriers for themselves in regard to genre or fabricated notions of what they’re supposed to like or not like. We should explore whatever it is we love, musical and otherwise, as that is who we are, and bring all of it into our music-making. If we’re not on a path of opening, of breaking down barriers, internal and external, and discovering who we are and who we might become, then how can we expect to offer something true and meaningful in our art? All the rigorous work of learning and developing a vocabulary of notes and chords and rhythms and songs is essential, and should be ongoing. If it makes sense to deal with that, I’ll jump in, but I try to look for angles that they don’t necessarily emphasize in most school settings. Encouraging them to simplify what’s happening, conceptually, is often helpful. I often hear way too much “chalkboard,” too much of the music never getting beyond people’s heads. A focus on connecting and grooving with each other is essential and often gets lost in attempts at sophistication or complexity. The music needs to communicate on a visceral level, first. My order of communication priorities: booty, heart, mind. I care deeply about reaching all of those elements, together, but for me it needs to happen in that order. We have to internalize feels or grooves, really feel them and dance with them in our own bodies, before we can expect to transmit them to other people’s bodies. With that goal, I have a method I often share of simplifying and internalizing different feels as shapes with a lift and a landing, which helps prioritize the essential gestures within a music figure and frees us up for expression and development. I try to get them dancing. I try to get them out of their own heads and beyond the imperative of playing the baddest solo imaginable, but instead focus on opening up and really committing with their bandmates to building something together. All of the aforementioned musical building blocks (notes, etc.) are merely opportunities for this connection. We need to focus on what we offer of ourselves through these notes, which are really vessels, and on the relation and magnetism we create between them and that which is offered by our bandmates, even everything around us, including the audience. Again, the musical gesture is merely an opportunity for this to happen. I try to get them to groove together and, instead of rushing from one idea to the next in an endless stream, to slow down and magnify the importance of each gesture, to hang out on one idea and explore it, turn it inside-out, balance it on its nose, all of which gives the rest of the band time to key into what’s happening and throw some elbows and energy into that, then things can start to build up and out into a meaningful sculpture, instead of just a two-dimensional game of follow-the-leader. When we realize that, no matter who has the lead at any given moment, it’s always a collective endeavor, always about what the group is creating together, with every single gesture of critical importance to the whole, then we have an opportunity to experience real communion, and we might learn that for this to happen we have to reach deeper and make ourselves more vulnerable to one another in the collective effort. And we see that the journey of developing one’s craft and one’s self must be holistic. TC: I’ve interviewed other musicians who’ve spoken about the importance of having a sort of “vibrational connection” with their fellow musicians. I’m curious if you ascribe any sort of spiritual meaning to that? SC: Music, like everything, is what we choose to make of it. When I walk my kids to school in the morning and look up at the early light sparkling in the trees, I can choose to take that for granted or, in my better moments, allow it to fill me with wonder, gratitude, and the clarity that everything is connected. Music can be a technical, surface-bound enterprise, or it can be a portal. No matter how many degrees of complexity we travel down the line in perceiving what the music is comprised of, I like not to lose sight of vibration as its fundamental. There is critical tension and release operating at that molecular level, just as there should be at other levels within a piece (rhythmic, harmonic, melodic, structural, etc.). When we offer a sound, we send waves that alter the environment in which we co-exist, waves that engage and vibrate with people’s bodies. We change each other’s bodies. The question then is, again, one of opening, on the part of musicians and audience. Regarding the audience, if we establish for them an environment of trust from the start, and if they are capable, they might open themselves and allow the organized tension and release, or magnetism, of these vibrations to reach them at deeper levels. For the musicians, as we seek higher levels of music-making, there’s no limit to the amount of opening we could pursue. We should all but turn ourselves inside-out, exposing what is most sensitized and real within us. That’s a scary place to be. It’s dangerous to allow such vulnerability, and it takes trust. It takes giving. It takes love. When we find ourselves with other musicians, other humans who are also willing to take this risk, we have a chance to commune on another plane. TC: That being said, how do personal dynamics end up shaping the inner workings of your various groups? SC: Although there’s plenty of historical precedent showing that great music can be made in a contentious atmosphere (purportedly the case with one of the classics, Money Jungle, for instance), it’s not an environment that I thrive in. I’m very attuned to personal dynamics in any of my groups, or I at least try and hope to be. In many cases, my choice of collaborators has been more about the individual than what instrument he or she plays. Whether it’s in a rehearsal, on a gig, traveling, or especially in the recording studio, I put a good amount of focus into shaping an environment that’s loose and empowering, where people feel like they can fully be themselves, explore and have agency over the music we create. It’s a beautiful thing when you get to that place with a group’s dynamic where the empathetic, playful banter that may happen through the airport, or on the train or in the green room, follows the band right onto the stage and just keeps flowing, transforming from words into sounds. TC: Based on your answer, I’m wondering if you compose parts with specific players in mind, or do you write in a more open-ended manner? SC: Both, either, other. It can be helpful to approach the compositional process from different angles. Whatever taps the curiosity. It can be a melody that starts to nag at me to come and play. It can be a certain shape or groove that changes how I move down the sidewalk (and I should say that a lot of ideas do come to me when I’m walking, when my body is in motion). It can be a conceptual notion I try to mold into something that generates an interesting piece. It’s been many things, and that’s important to me. While there are pieces that were written with certain individuals in mind, I’d describe those instances as a composition growing within an aura of inspiration from my connection with that person, rather than a concrete way of considering them or how they play, specifically, during the process. This does call to mind a couple of funny moments, though, in recent Rosetta Trio rehearsals, as we prepared for our latest recording, during which Liberty was having a bit of difficulty pulling a certain part together, and I found myself responding with mock exasperation, “Man, how can you not get that? It’s 100% Liberty Ellman!” Only then did I realize I’d written the part just for him. Every tune has its own story, but for one example, take “How Close Are You” from the Rhombal album, dedicated to my late brother, Patrick. The piece came directly from one of our last conversations, in the spring of 2014, late in his battle with cancer. On that day, when I called from Brooklyn to his hospital room in Memphis, he was manic, almost hallucinating from the pain medication. He kept saying “Hey man, how close are you?” thinking I was in town and on my way to visit him, which thankfully had been the case on numerous other occasions, but clearly was not in this instance, which made his question both beautiful and heartbreaking. I tried to put him at ease through the course of our brief conversation, and when we hung up, this melody came right at me. I wrote it down quickly, in its three phrases. It stayed just that melody for a few months, and at first, I thought that’s what it should be, even that it might be wrong to alter or add to it. Around the same time, I was beginning to work with the quartet and get to know more of the rich dynamic between Adam and Ellery (on trumpet and tenor saxophone). I believe that’s what sparked my hearing the countermelody, which I then became more obsessed with than even the original melody. I relished playing with those interweaving elements and their harmonic implications, and eventually got to the piece that we recorded and still love to explore. TC: Regarding composition, what unique challenges do your various line-ups offer that more conventional ensembles might not present? SC: Are my groups that unconventional? My first two albums (Poems and Other Things, Tuckahoe) featured drums, piano or guitar respectively, and saxophone. More recently, after a number of duo projects, and especially compared with Rosetta Trio, the Rhombal quartet could be seen as a return to a more established, albeit quirky, format, given the precedent for a two-horns, bass and drums quartet. That in itself is a great challenge, and potentially stifling ... how to navigate precedent and tradition, inspiration and reverence, and still offer something new and meaningful to the conversation, which has always felt very important to me. Without any delusions toward reinventing music, I do hope to contribute some unique perspectives during my time here, maybe even stretch the walls out a bit. Looking again at Rosetta Trio, it’s true that through a certain lens the lineup of acoustic guitar, electric guitar and bass seems unusual, and I think people often don’t know what to make of it until they actually hear the band (shouldn’t that always be the case?). At the same time, for someone who grew up loving and playing a lot of rock music, for instance, what’s so strange about stereo guitars? That sound is firmly embedded in our culture, although I’ll allow that removing it to the decidedly mellower context of this trio does change the terrain. Or, I should say it seems to come off as mellower. To me, from the inside, we’re working, often rocking, hard! All this to say that I don’t really know where the line is, I just deal with the challenges, opportunities really, of each ensemble as it is. This reminds me of how much fun it can be to work on a film score, where often the choice of sonic palette is freed from these expectations of what a traditional ensemble line-up means. Of course, there may be other orthodoxies to contend with, depending on the situation. TC: The jazz bands of a previous era featured long-term personnel for extended tours, but that has largely changed today, for various reasons, both aesthetic and economic. What advantages and challenges do you personally find in maintaining so many different groups? SC: I would characterize the change as being precipitated primarily by economic forces. It’s just a totally different reality as far as the number and nature of gigs that exist, how they pay, and all with respect to today’s costs of living. Drop in a heavy dose of digitization, with file-sharing and streaming essentially equivalent in their lack of remuneration, and you’ve got a challenging recipe. People are scrambling, and this leads to stress and instability of all kinds. Somehow, though, there’s a lot of great music being made. It is harder to keep groups together, but it can happen in a different way, perhaps more sporadically, work-wise, but maintaining and developing relationships over the longer term. There is an aspect of this being by both necessity and design, though. The necessity part comes down to diversifying of one’s work opportunities, such as maintaining a number of different groups. This leads to a lot of gear-shifting and logistics, which can get overwhelming, but at the same time I feel incredibly blessed with all my collaborations, and I wouldn’t have it any other way. I’m working with so many beautiful humans, seekers who enrich my life, who challenge and teach me in different ways. It helps also to have different roles within the various ensembles. For instance, there are some for which I’m the leader, with all the musical, logistical, financial responsibilities, then others that are fully collective, and still others for which I’m a sideman and my responsibilities are mostly musical. Having this diversity of roles makes a lot more possible, and the differing perspectives are important and instructive. Of course, you can’t replace time and shared experience when it comes to deepening these relationships. Vijay and I, for instance, have been working together for almost nineteen years, and I think that comes through in every gesture. At the same time, when chemistry is present, it can be sparking right from the start. I think of the debut Secret Keeper album, Super Eight, which includes the very first notes Mary Halvorson and I ever played together. I still remember the bracing energy of that first meeting. Then there’s the Rosetta Trio album that I’m now mixing, our fourth release in fourteen years of working together. The depth of feel and communication are knocking me back. It’s thrilling and deeply satisfying, and a reminder that all the work of keeping this trio together over so many years has led to this. TC: Considering your ability to navigate multiple styles in an array of different ensembles, are there any aspects of the jazz tradition that you currently find inspiring and/or any established practices you find creatively constraining? SC: There’s so much that I find inspiring, in so many places. Musically, no matter the sources or traditions, I need to feel authenticity. I need to feel an artist taking risks, principle among them the risk of revealing deeper truths from within themselves. Constraint comes when I feel people hiding behind a wall of flash, focused on what they can display rather than discover, when I hear the chalk board, when I hear sports, people getting over by pushing a series of buttons that audiences of a particular genre come to expect. TC: In reference to working with others, how do you feel about studio recording versus live performance, and how does that affect your own playing in each situation? SC: I love being in the studio and have maintained a fascination with recording since I was a teenager and started messing with my first 4-track cassette recorder. The differences between live and in studio are numerous, and perhaps part of the trick in the studio is to make most of them disappear. The acoustics and energy flow in the studio are often far different from the stage, given that there is usually no audience and more isolation among the instruments and musicians. We often hear, and hopefully feel, each other through headphones, as opposed to receiving the vibrations in all parts of our bodies at once. This makes the studio very challenging as far as getting the communication to be holistic, instead of just existing in our heads. Perhaps we have to learn to reach deeper in ways that come more naturally onstage. We then have to find ways to let go and reveal ourselves in an environment that can seem as though under a microscope. I’ve learned that, for this reason, the vibe in the studio is a most sacred and fragile thing, and must be protected and nurtured. When I’m responsible for running a session, I prefer to have just the band and engineers present. Keep it in the family, among those who are in it together, so they have less chance of feeling self-conscious or judged. It needs to stay loose, positive, supportive, empowering. We need to be able to go into the control room, listen back to a take, and have open conversations about what we could do together to get the music where it needs to go. It’s so easy to get caught in a spiral of self-flagellation under that microscope, and when this happens we lose sight of the crucial fact that it’s really always about the collective, about the energy that we could create only together, beyond our selves. The trick is to figure out enough of a comfort zone with the sound and setup so that we can let go and gives ourselves fully over to the music, to each other. When this happens, the studio is basically heaven. TC: Similarly, what are your thoughts on the state of the recording industry, specifically regarding archival documents (CDs, vinyl) versus more ephemeral formats (downloads, streaming)? SC: Well, I’m tempted to engage in a philosophical discussion over what is actually archival vs. ephemeral, but I get what you’re asking. I feel great about music. I don’t feel great about the music industry. I still sell CDs, especially at shows, and I do have a couple of my releases on vinyl (Thwirl, Rhombal), which I personally love and am glad to be able to offer to others who appreciate the numerous benefits of that format. Also, I get the practicality of downloads or streaming, and I really appreciate the lack of plastic involved. With downloads, though, at least people are paying something for what they’re getting. Streaming essentially doesn’t pay. It’s unsustainable, just a hair better than straight-up piracy. All this has taken a huge piece out of the equation of how musicians (and how many musicians) can make a living doing what they do. It’s also part of a greater spiral of devaluation, which isn’t helped by the poor sound quality of MP3s and streaming. In our society we have a hard time valuing things we don’t pay for, and we’re now going on a couple of decades of having the option to not pay for music. There’s also the very significant ritual aspect to physical formats. Holding something in your hands, even smelling it, placing it into a player, or onto a turntable, moving the arm and dropping it with care. Ritual that nurtures mindfulness, connection. Obsessing over the album art as you listen over and over. Repetition, immersion. One of the issues that’s come up again and again for me at masterclasses is many younger musicians struggling to know what to listen to. Ironic, as they could pretty much listen to anything they want, at any time, but the infinity of the internet is overwhelming, and it’s too easy to remain on the surface of things, flitting around from one click to the next. There’s no context. How meaningful is a drop of water when you’re bobbing around in the middle of the ocean? I’ve realized that, in a way, they’re really asking me how to fall in love. TC: Well said, sir. Finally, what projects do you have planned for the immediate future? SC: Well, first thing is to finish the mixes on this next Rosetta Trio album and start planning for its release. I’m hoping to write at least one new piece for the upcoming Rhombal quartet dates in April and May. This is the early stages of a new cycle of songs for that group that I’m now mulling over. It’s taken some time, given how specific and powerful the inaugural journey with that band was. I can’t really overstate it. We went to the mountaintop together. The problem, then, is where do you go from there? What’s occurred to me is to dive deep into the ocean. I can’t say more, right now, as I’m only beginning to discover what this may mean, but that’s the plan. This month we’ll finish mixing a live recording from last November in Zurich with Ingrid Laubrock and Cory Smythe. It was a very special concert, well-recorded, and it captures a whole other range of the trio, quite distinct from our first studio album. That should be out on Intakt hopefully later this year. I’m working on dates for that trio, as well as Borderlands Trio, in the States and Europe for next year, along with finalizing a Rhombal tour in Europe for this fall. I recently put together a new quartet, Elemental, featuring Michaël Attias on alto saxophone, Eric McPherson on drums, and Ches Smith on bowed percussion and tympani, with me on bowed bass. The concept is a type of magnification in the extreme, where all elements of the music emerge through texture. There’s also a string trio with Okkyung Lee on cello and Mat Maneri on viola that has been working, on and off, for a few years. I’d really like to continue developing, as well as record, that group. Along with all this I’ve added a new challenge, which is a writing project, On Magnetism, exploring and connecting ideas I’ve developed and found most helpful through my years of teaching, and which, until now, has been structured as a lecture, discussion, and performance masterclass. So, each morning I’m now carving out time to write, not music but words, which is a very different path for me. I’m not sure, yet, what it will become ... hopefully something resembling a book? For now, I’m just trying to get it all down, then I’ll shape it from there. All this while trying to keep my family close and growing in the right directions, much of which is just to not derail my two boys, who so far are blindingly beautiful young humans.